Unison witch-hunt: Defend the four, come to the lobby! Shopworkers' union Usdaw's annual conference took place against the background of the credit crunch crises and just before Labour's election debacle, writes Robbie Segal, delegate, personal capacity. Wales: This year's local election results in Wales have delivered a devastating blow to Labour, writes Dave Reid, Socialist Party Wales. Racist BNP have no solutions! ISR mounts London protest Around 70 International Socialist Resistance (ISR) members and supporters joined the first protest against the BNP's newly-won seat on the London Assembly, writes Ben Robinson, ISR national organiser. ON TUESDAY 29 April, following a short meeting at Grangemouth oil refinery's gates, the early shift returned to work, ending the 48-hour stoppage that had brought the flow of oil from the North Sea to a halt, writes Ian Leech, Glasgow. TORY MP Nadine Dorries has launched a campaign to reduce the upper limit on the time of abortions from the current 24-week limit to 20 weeks, writes Sarah Sachs-Eldridge. The Socialist would welcome reports from readers of any other anti-cuts election successes, writes Chris Moore and Derek McMillan. THE SRI Lankan government is engaged in a war against the Liberation Tigers of Tamil Eelam (LTTE) in the north of the country, writes Srinath Perera, United Socialist Party, (USP - CWI, Sri Lanka). FORTY YEARS ago this month, France was gripped by a revolutionary fever. Within days of a one-day general strike being called in solidarity with protesting students, ten million workers were on strike. ESTABLISHMENT POLITICIANS are so unpopular that in last week's council elections every party tried to pose as the opposition whether they ran the council or not, writes Dave Griffiths, Coventry. South Camden Community School, Charrington Street, London NW1. Speakers include Bob Crow, RMT, Mark Serwotka, PCS and Brian Caton, POA. Sunday 29 June 10am - 5pm. "On the face of it, Unison are about to make themselves look a laughing stock", Rory Bremner comments, on the accusations against Onay Kasab. 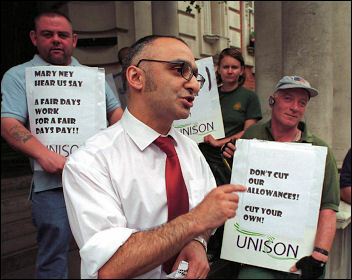 Letter sent by Markhan S Bajwa, director of Greenwich Council for Racial Equality to Unison general secretary Dave Prentis to protest about the treatment of Onay Kasab, Greenwich Unison branch secretary. The appalling effects of the cyclone which hit the vast Irrawaddy river delta, have shocked people all over the world, writes Keith Dickinson. 'THE GLOBAL economic crisis and the socialist alternative today', was the theme of a two day speaking tour of Ireland last week by Peter Taaffe, general secretary of the Socialist Party (England and Wales), writes Kevin McLoughlin, Dublin. On the face of it, with a series of popular measures implemented and opinion polls showing the Scottish National Party (SNP) with an extended lead over their rivals, the first anniversary of the SNP coming to power is a momen, writes Philip Stott, International Socialists, CWI Scotland. What will Boris Johnson mean for London? After the 1 May elections: BORIS JOHNSON'S election as Mayor of London capped a string of successes for the Conservatives in the 1 May local elections, indicating that a Tory victory in the next general election is a serious possibility, writes Neil Cafferky. AFTER A hard-fought election campaign, Socialist Party members in Lincoln celebrated a first-time showing of 127 votes (6.2%) in the 1 May elections in Carholme ward, writes Nick Parker. FOR THE first time in 21 years the Tories won Bury council in Greater Manchester, writes Paul Gerrard. 60 year anniversary of Israel: Can there be a resolution of the Palestinian/Israeli conflict? Since the Israeli state was founded 60 years ago, many Jewish people around the world have moved there on the promise of prosperity and security, writes Judy Beishon. No reduction in the time limit, End the two-doctor rule: On 20 May Tory MP Nadine Dorries intends to move an amendment to the Human Fertilisation and Embryology Bill to cut the current upper limit for abortion from 24 to 20 weeks, writes Eleanor Donne, Basildon Socialist Party. The BNP have no solutions...and no clue! On the morning of 9 May our second protest against the British National Party (BNP) took place as the newly elected Greater London Assembly met for the first time since the election on 1 May. On Friday 9 May, around 100 University of Manchester students staged a second protest under the banner of 'Reclaim the Uni'(RtU), writes Abigail Taylor, Manchester Socialist Students. Left Unity by itself has an overall majority on the national executive - an endorsement of the left's leadership in the face of the government's cuts and privatisation programme, writes Janice Godrich, PCS president, personal capacity. Over a hundred people marched through the streets of Stoke Newington, north London, on 10 May, writes Matthew Waterfall, branch secretary, Hackney Unison. Following a successful inaugural conference of the North West Shop Stewards Network (NWSSN) last month, the elected committee met for the first time on 10 May, writes Dave Lunn, assistant secretary NWSSN, personal capacity. Delegates to the annual conference of the Wales TUC, meeting in Llandudno on 21-23 May, face the prospect of a right-wing offensive to undermine the democratic traditions of the trade union movement, writes Alec Thraves, Swansea trades council delegate.. Urgent action needed: JUST WEEKS before the 60th anniversary of the National Health Service, government plans to reorganise and privatise it could mean the end of a health service that is publicly owned and free at the point of use, writes Lois Austin. 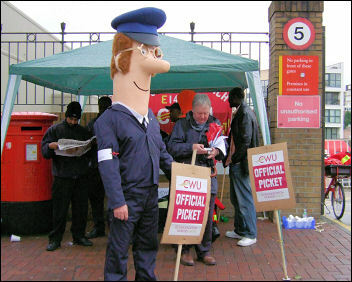 is direct responsibility of Unite joint general secretary Tony Woodley. Three sacked Belfast Airport shop stewards, members of Unite (T&G), have resumed their protest to achieve payment of legal costs and hardship money from their union, writes Kevin Parslow. Speakers include Bob Crow, RMT, Mark Serwotka, PCS and Brian Caton, POA, plus shop stewards from disputes around the country. Please note that the next meeting of the North West region committee of the National Shop Stewards Network will be held on Saturday 19 July, not 19 June. 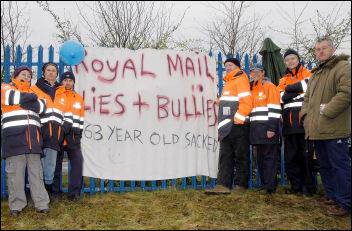 Give us back our Post Office! Housing crisis worsens: In the same week that Tony Blair buys his sixth house for £4 million, the Local Government Association announced that another million people could join housing waiting lists in the next two years, writes Lois Austin. Around 70 angry protesters lobbied the Unison 'disciplinary hearing' which started on 14 May, writes Jane James. France 1968: Be realistic - demand the impossible! Book review: In times when the idea of a socialist revolution is treated as laughable, socialists are commonly asked: is a revolution possible in a rich country like Britain? London, Wales, Sheffield, Merseyside reports: IN AN inspiring rally, 120 people from across London were treated to a first hand account of the political movement in France in 1968 from Marie-José Douet. Ireland: Vote no to Lisbon Treaty and EU militarisation! SCHOOL STUDENTS have been leading the fight against education cuts in France, writes Manny Thain. CAMPAIGNERS FROM Lansdowne Primary School in Canton, Cardiff are celebrating, writes Ross Saunders, Cardiff West Socialist Party, Unison steward, Fitzalan High School. 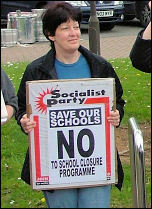 ON 15 May, over 100 Southampton University students occupied the entrance to the lecture theatre due to host the University Court meeting, a jamboree for elite dignitaries and corporate university sponsors such as HSBC bank a, writes Clare Blackwell, Will Schafer-Peek and Gavin Marsh, Southampton Socialist Students. An organised plan of action against the cuts by the NHS unions is urgently needed!, writes Ian Howie. IN SPAIN it was 76%, in Italy, France and Germany it was over 80%. That was the percentage of people who told a Financial Times/Harris poll that the gap between rich and poor is too wide. 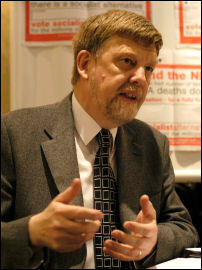 Trade Unions have been reading their own obituaries since workers first combined, writes Chris Baugh, Public and Commercial Services union (PCS) assistant general secretary, personal capacity. 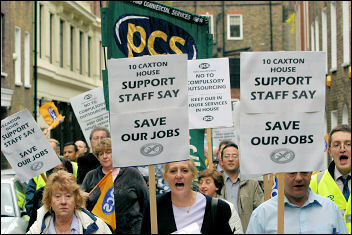 Public-sector workers say pay up! Step Up Fight Against Low Pay! New Labour sunk to a new low in the Crewe and Nantwich by-election last week, writes Jim Cessford, former Crewe socialist activist. I told my union: "We need a new workers' party"
THE START of the week and the same pressure begins. From behind a bank of screens a worker mutters: "So they want us to become bloody monarchists now?" Steve Wootton writes. DETAILS OF MPs' expenses are finally public after three years of stonewalling by the House of Commons. The Speaker, Michel Martin, spent £200,000 of public money attempting to block such details. Last week's failed terrorist attack in Exeter caused a wave of shock and surprise in Devon and Britain as a whole, writes Jim Thomson, Devon Socialist Party. THE VARIOUS attempts to restrict rights to abortion, via amendments to the Human Fertilisation and Embryology bill, ended in defeat on 20 May as MPs voted to keep the status quo, writes Eleanor Donne. Tax the rich not the poor! Over four million low-paid workers felt some relief when Gordon Brown was forced into his tax u-turn, writes Judy Beishon. LONDON'S NEW Tory mayor Boris Johnson has appointed a ruthless private equity businessman as his "first deputy mayor" in charge of transport, writes Roger Shrives. CREDIT CRUNCH hitting wages and prices? Not true for City of London fat cats who have been awarded bonuses totalling £13.2 billion so far this year. CAMPAIGNERS IN Greenwich are fighting to save community centres and halls. Greenwich council wants to hand over management of halls and centres to a community management board. THE WAVE of xenophobic pogroms which have swept through the squatter camps adjoining black townships around Johannesburg, Durban and Cape Town, has so far claimed more than 50 lives and has left over 80,000 homeless. Weizmann Hamilton, of the Democratic Socialist Movement (CWI, South Africa) reports on the current crisis and the issues underlying it. Comment: Despite spending billions on 'youth justice' the government has failed to stem youth crime, a new report shows, writes Pete Mason. Feature: The government's proposal to extend the period the police can hold suspects without charge to 42 days, will be presented to parliament in the next few weeks. ANNA LUCAS explains that, far from being a step in the right direction, these new laws, and other 'anti-crime' measures over recent years, amount to a major and unjustified attack on our democratic rights. This year's conference of the civil service union PCS was a resounding success, writes Bill Mullins, Socialist Party industrial organiser. Shopworkers' union Usdaw has announced that the election for general secretary will be held over the summer, when many of the branches are not meeting. A London Usdaw member writes. Labour, Tories, LibDems ...they're all the same! "Et tu, Crewe?" Gordon Brown might have muttered to himself as the knife of another electoral drubbing sank into his back, writes Greg Maughan, Campaign for a New Workers' Party.